I ended last summer a little burnt out from quilting. I was feeling a little overwhelmed, un-inspired, and un-motivated to make anything. Then this fall I was so sick, I stepped away from sewing, Instagram, and Pinterest for 2 months or more. I’d check in now and then, but just to answer questions and make sure my accounts weren’t hacked. After a nice long break, an amazing thing happened! I started thinking about fun fabric and color combos again, drawing up quilt patterns in my head, and getting excited to sit down and sketch out a new, simple quilt design. Taking a break was just what I needed to remember what I love about quilting. 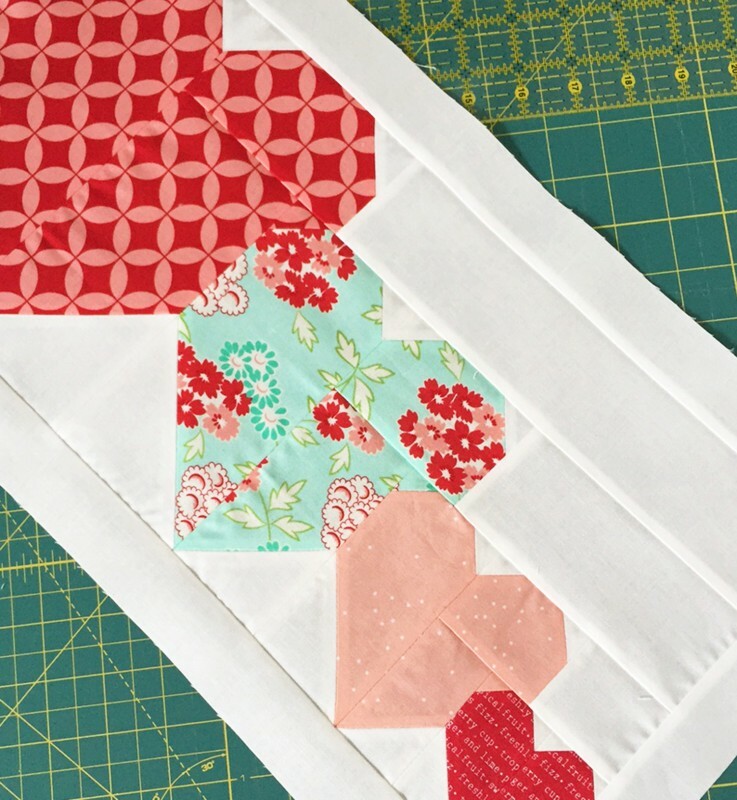 I love simple quilts, small quilts (so I don’t get bored), limited color and fabric schemes, and un-fussy quilting. I free motion quilted last week for the first time in ages…just an old favorite meandering (or stippling) pattern, and it was such a stress reliever! I forgot how much I loved that. So the moral of the story is sometimes it’s important to step back, take a break, and remember what you love about quilting, or sewing…. or whatever it is that you love to do. 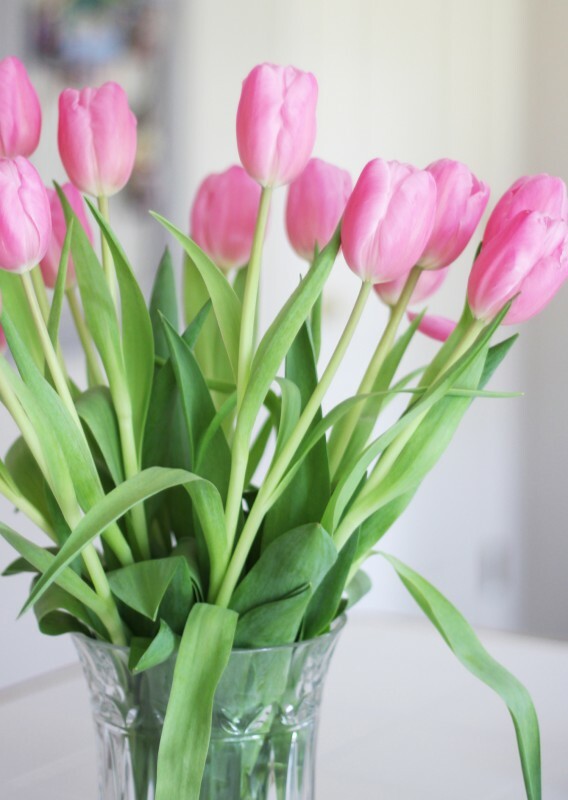 These beautiful pink tulips are sitting on my kitchen counter making me excited for Spring…aren’t they the best color?! Here’s a peek at a free little pattern I’ll have for you later this week. If I can figure out how to attach a PDF to a blog post…I’m so technically challenged it’s not even funny. I think you’ll like it…it’s fun and fast(ish) to make! I just love the freshness and simplicity of your work I am so glad you are back! I found a quilt pattern that I loved and made 2 quilts for my 2 grandsons in California. I live in Illinois, then I mailed them off along with a small gift for my daughter. It cost me $40.00 to mail it to her, well it was returned because she moved, even tho she say she put in a change of address. I sent it back to her at her new address and since, it just disappeared the whole package just disappeared. she nor I has seen nor heard anything at the post office. Now I have no inspiration to sew, normally I love it and could get up after 12 to 15 hours of sewing the day before and start all over. I keep waiting for my inspiration to return but nothing yet. Oh I’m so sorry, that is a nightmare! Just give it time and don’t rush yourself…inspiration will come back when you are ready for it. I hope they find the package…I’ve had lost packages that come back to me months later, so I’ll be hoping for yours to come back to you! So glad that your back to your creative self. A mental rest is sometimes a very good thing. The sneak peek looks very good. I’m glad you’ve found your sewing motivation again :) and I am excited to see the free pattern! Welcome back! I’ve missed you and look forward to what you create next! Glad you are back & feeling better!! I love your style, both in color palettes & patterns! I hope the rest of your pregnancy is smooth sailing! It’s good to take a break at anything to rejuvenate oneself! The holidays can too put everyone in a slump with the hustle and bustle. I pulled out a pattern with all the fabric i had purchased a year ago to go along with this pattern, and cut it out yesterday, starting my first quilt top for this year. I will probably begin piecing by the weekend…. With working full time, small projects in between the large projects gives me a feeling of accomplishment, too. Welcome back and looking forward to your posts again…. I agree…sometimes a break is necessary. Glad you were able to recharge and come up with some ideas. I’m so glad you’re back – your inspiration is catching. Love your new projects too. BREAKS ARE GOOD! Glad you are recharged and ready to rock and roll. I’m liking those hearts and where you are going with it. Can’t wait! Glad you are feeling better! What a cute pattern…looks fun! If you figure out how to attach a PDF to a blog post, please let me know…I’m technically challenged for sure! Well done for listening to your body and stepping back and breathing again. It is so important to understand when we are becoming wary. So pleased that your are feeling much better. Those hearts look so perfectly pretty! Yes, you’re so right. Clears the head. Glad you’re excited again about creating. Love your work and can’t wait for PDF of these cute hearts. Great to see you’re back Allison! I love your style. I’m looking forward to the pattern, It’s oh so cute. It’s good to see you! I sorry you got sick, but not a horrible thing to step away. And hey, here we are waiting for you. I can understand how to stop and ‘smell the flowers’. I have never really been busy with sewing or quilting. This year I feel like I want to quilt every day so that’s what I’m doing and I love it! Take your time this year, you are going to have a baby! Glad you’re back! Hearts are sooo cute! Looks like it’s time I popped over for a cup of tea, or diet cola please. so you can share all your awesome ideas with me! Yay! So happy for you that you’re feeling refreshed and motivated! I’m glad that you’re back! I think we all can benefit from a break now and then. I love your style…It’s very much like mine! Simple and straightforward! I look forward to the heart runner tutorial! Thanks for creating! Kudos to you for recognizing when to take a step back and take time for yourself to refresh and renew! We’re so glad you’re back and it looks like you have your mojo! Welcome back! I get so overwhelmed sometimes. My son wants a simple quilt. I’ve figured out a charm quilt like the one in your lower right hand corner. I love the way you quilted that with diagonal lines through the white squares. Do you have more photos of that quilt or any tips? Lie the heart block. Cannot wait to get the instructions. Meant to say LOVE the heart block. HATE autocorrect. After 3 decades being a potter the break I have taken may have turned into a migration to quilting ?? ?I’m so glad you’re back and congratulations on your pregnancy ! Loving the hearts, especially when we are thinking of Valentines! I’m glad you got your groove back. Your stippling is so beautiful. You can tell you were relaxed when you did that! The heart block is super cute. Love that you came up with it-so creative. seriously, so creative. I absolutely love all of the quilts you posted! The colors and patterns! And I can’t wait to see the heart pattern. Very cute! Thank you for this post!!! And yes, those tulips are the prettiest color!!! Sometimes we get so caught in the beauty of super fancy custom quilting, that we forget about the beauty of simplicity! Stippling/meandering is still one of my very favorite ways to quilt a quilt. Glad to hear you’re coming out of your slump. I know what you mean about that. I’ve done it myself. But I love seeing the lovely quilts you make and I always enjoy pictures of your kids. I miss the days when mine were small. Enjoy these days Mom, as they go by quickly. How nice that you took a break and found your mojo! Enjoy the creativity! So glad you’re back – a rest really is the best medicine. You are inspiring! Be encouraged to keep doing what you have been called to do-mothering, creating, teaching, designing, and so much more! I love your posts and also understand how sometimes you just need a breather. I’m still slowly working on your grayscale quilt in black and blue. boy is that a challenge. I went with a yard of so many different blacks and blues because it will be a king size quilt (I hope) when done. I think it’s a challenge to MAKE a pdf file so to upload should be a piece of cake LOL. So sorry that you were sick Allison, but glad you are back with a bang! I love your style! Sometimes a break is just what you need. I had trouble attaching PDFs to posts because more often than not, the PDF would be resized and then the printout for a paper pattern would not be right. This was especially true if I tried to use Google Drive. I finally found a great way by saving it as a file in Dropbox and then sharing the link with my readers. That way people can just print at actual size. Hope that made sense. I get it x100. I took a break too since last summer and I’m feeling motivated to quilt for me again. I can’t wait for your cute free pattern it looks simple and would look great on my couch as a pillow for February. I’ve always been inspired by your work and it’s great to have you back! I’m looking forward to your next post, it looks like something good for Valentines Day. Glad you’re back and feeling inspired again! Love the quick peek at the project too! So glad to hear you’re back! I’m the same way- keep it simple! I like small quilts because I too become quickly bored! So, if we know that going in, then we’re good! :) Your tulips are gorgeous and love the color! Can’t wait to see your heart pattern- it looks like fun!! I so agree with you on the simple, unfussy part of quilting, that is absolutely what I enjoy too. I’m glad you are coming back around to what makes you happy! Your post really hit home for me. About a year and a half ago I turned in the manuscript and quilts for a book. For about 2 months after I got them in the mail I had zero desire to quilt. I didn’t like quilting at all. I kept thinking this is awful! I write a book on quilting and then never want to quilt again! I’m going to have to fake it! But no, after about 4 months my quilting mojo came back. I really think that we all need a break now and then to slow down and recharge. Oh I hope you figure it out- those hearts are JUST right! I find breaks to be refreshing as well. Sometimes it is hard to see why you’re doing things when you’re so busy in the middle of it all. 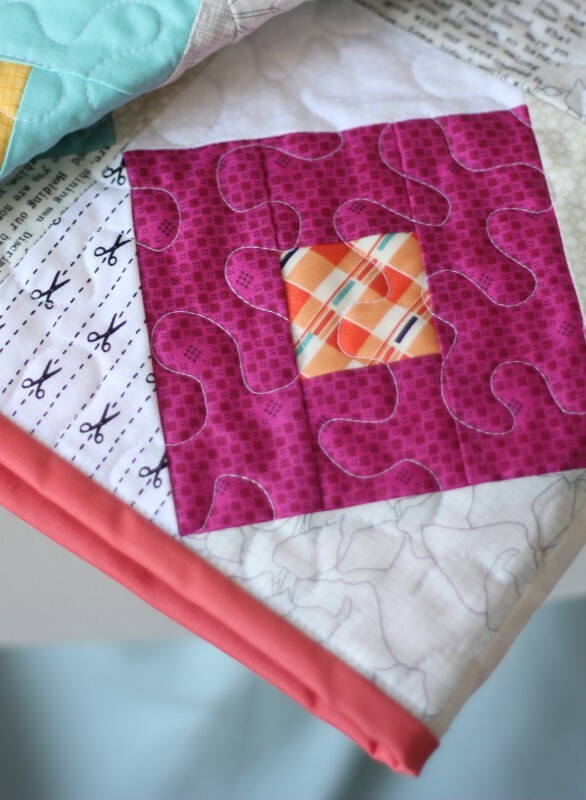 I love your take on why you quilt! Well put, agree with everything you said. Sometimes I get too caught up with what’s happening on Instagram and try to participate in too many sew-alongs, swaps, etc. and don’t get anything finished. Plus, I find I loose my own creativity if I’m just copying everyone else’s work. I’m backing off this year, thinking about each project i undertake to make sure that I’m sewing what I really love. Thank you ever so much! this is soooo lovely and yes, it is a great relief sometimes to step back and get a fresh point of view! Beautiful, creative quilts! Just looking at them makes me feel happy! Glad you are feeling better! 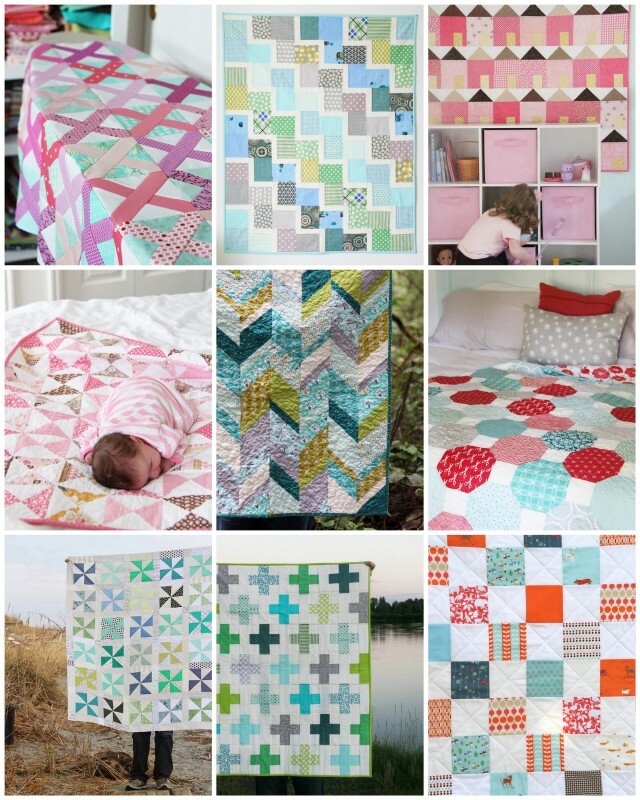 I love the diagonal style quilt in blue/green in the middle, is this one of your patterns? Thanks!